This lecture is an introduction to Software Components & Services. 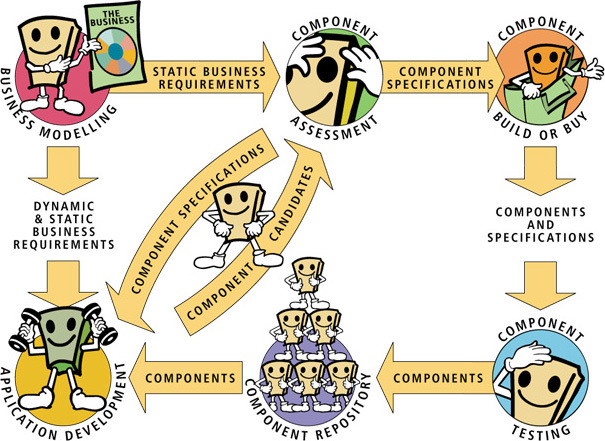 It is mostly illustrated by means of the Java EE platform and related technologies. Technical services are natively offered by middleware. Applications call for such predefined/pre-implemented services in order to avoid the development of their own policy for security, transaction management, etc. For instance, EJBs can be endowed by security features to limit their access by third-party components/services. Security features are access roles and associated credentials. For instance, Java Message Service (JMS) in Java EE or CORBA Event Service in CORBA allow asynchronous communication between components/services. For instance, timer services in the EJB technology (see below) can be requested in a uniform way by components/services. Such services in particular avoid the use of internal clocks. Typically, the Timer and TimerTask classes from Java SE have not to be used in Java EE because of distribution. This corresponds to the need for temporal data that are independent of each JVM (Java Virtual Machine) involved in distributed computing. Java Transaction Service (JTS) is the introduction in Java of the Object Transaction Service (OTS) from CORBA. Java Transaction API (JTA) is a set of Java EE classes and interfaces to manage transactions among distributed components/services. JMX (Java Management eXtensions) is a Java SE technology to monitor Java applications: tracing, stopping, restarting, etc. The Java logging API is another service for application tracing. Java Naming and Directory Interface (JNDI) is a Java SE technology to manage names of resources (e.g., message queues, data sources, URLs, computing units like components/services...) in distributed systems. This covers resource location search and resource binding to handle these resources in programs. SOA refers to applications that do not own “internally” their functionality. Instead, they connect to well-delimited self-contained functional pieces named “services”. Services are “everywhere”. In fact, the SOA paradigm has become popular with the emergence and large adoption of Web Services. Service computing is the extreme distribution of application including mobility of computing supports (“Internet of Things”, smartphones...) and involving new programming concepts, methods and tools. An ESB eases the discovering and access to services in a business perspective (administrations, companies, divisions of companies, holdings...). It includes, for instance, service interoperability, both from a syntactical and semantic viewpoint through, in the second case, service mediation facilities. For example, the PETALS ESB is a Java platform for advanced SOA. Cloud computing is the most innovative SOA application principle based on the now famous IaaS (Infrastructure as a Service), PaaS (Platform as a Service) and SaaS (Software as a Service) trio. Big data refers to immense data sets generally produced by Internet devices, users... These data sets are characterized by a high scattering, even a deep dilution. Big data is associated with a set of devoted technologies like Map/Reduce (Apache Hadoop), NoSQL, etc. What is Java Enterprise Edition (Java EE)?